A blood test , also known as bloodwork, is a laboratory analysis performed on a blood sample. 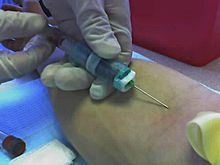 The sample is usually taken from a vein in the arm using a needle, or via fingerprick. Blood tests are used to determine physiological and biochemical states, such as disease, mineral content, drug effectiveness, and organ function. They are also used to test for certain drugs. ↑ "Blood Panel". Retrieved 2013-10-28. This page was last changed on 15 May 2018, at 08:38.